*GM CERTIFIED! I*ncludes a 12-Month/12,000 mile bumper-to-bumper limited warranty, 6 year/100,000 mile Powertrain limited warranty, scheduled maintenance program, roadside assistance, and OnStar and Sirius XM Satellite Radio trail offers.KBB.com Brand Image Awards. Boasts 22 Highway MPG and 15 City MPG! This GMC Yukon delivers a Gas V8 6.2L/376 engine powering this Automatic transmission. WHITE FROST TRICOAT, WHEELS, 22 X 8.5 (55.9 CM X 21.6 CM) ULTRA-BRIGHT ALUMINUM with Midnight Silver premium paint, TRANSMISSION, 8-SPEED AUTOMATIC electronically controlled with overdrive, tow/haul mode and tap up/tap down shifting (STD). 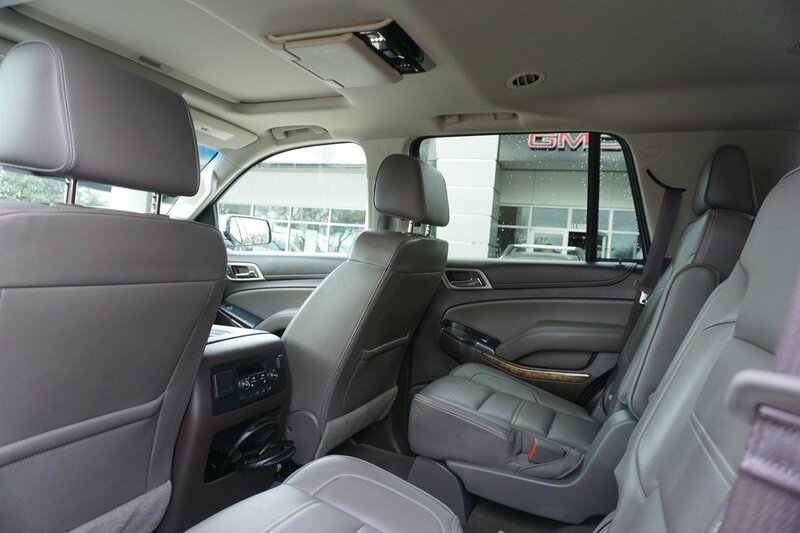 *This GMC Yukon Features the Following Options *OPEN ROAD PACKAGE includes additional 9 months of SiriusXM Radio and NavTraffic service, (CF5) power sunroof, (U42) rear seat entertainment system and on SLT (IO6) Audio system with navigation, LICENSE PLATE FRONT MOUNTING PACKAGE , TIRES, P285/45R22, ALL SEASON, BLACKWALL (Included and only available with any 22 wheels. ), SUNROOF, POWER, TILT-SLIDING with express-open and close and wind deflector, SEATS, SECOND ROW BUCKET, POWER (STD), SEATS, FRONT BUCKET WITH PERFORATED LEATHER-APPOINTED heated and ventilated seat cushions, 12-way power driver and passenger seat includes 6-way power cushions, driver seat 2-position memory, 4-way power lumbar control and power recline (STD), REAR AXLE, 3.23, LPO, CONSOLE INSERT ORGANIZER TRAY, ENTERTAINMENT SYSTEM, REAR SEAT BLU-RAY/DVD with remote control, overhead display, Wi-Fi wireless projection capability, two 2-channel wireless digital headphones, auxiliary HDMI/MHL audio/video input and 2 USB ports, ENGINE, 6.2L ECOTEC3 V8 with Active Fuel Management, Direct Injection and Variable Valve Timing, includes aluminum block construction (420 hp [313 kW] @ 5600 rpm, 460 lb-ft of torque [624 N-m] @ 4100 rpm) (STD). *Visit Us Today*If you have any questions or would like to schedule a test drive please feel free to contact me, Cory Covert, via email or at 512-583-3411 or visit us at 11750 Research Blvd Austin, TX 78759. Come see why we here at Covert Buick GMC Austin have been in business for 110 years and counting, and providing Texas with a superb selection. and exceptional customer service! Se Habla Espanol.